Laurie Boyd: What Rules Do We Need? Even the most relational and least punitive models for school behavior admit the need for establishing limits for student behavior. The rules you publish, communicate and enforce form the outline for those limits. Some schools or teachers like to use the word "expectations" or "norms" instead of "rules." Since we all have to obey laws, follow procedures, or comply with policies in our adult lives, I do not shy away from the use of the word "rules" in working with children or teens. Because I always wanted to be "a teachers' principal," a leader who remembers the struggles and demands of the classroom, and who appreciates and confirms teachers' decisions, I avoided requiring the same set of rules for all classrooms, for years. 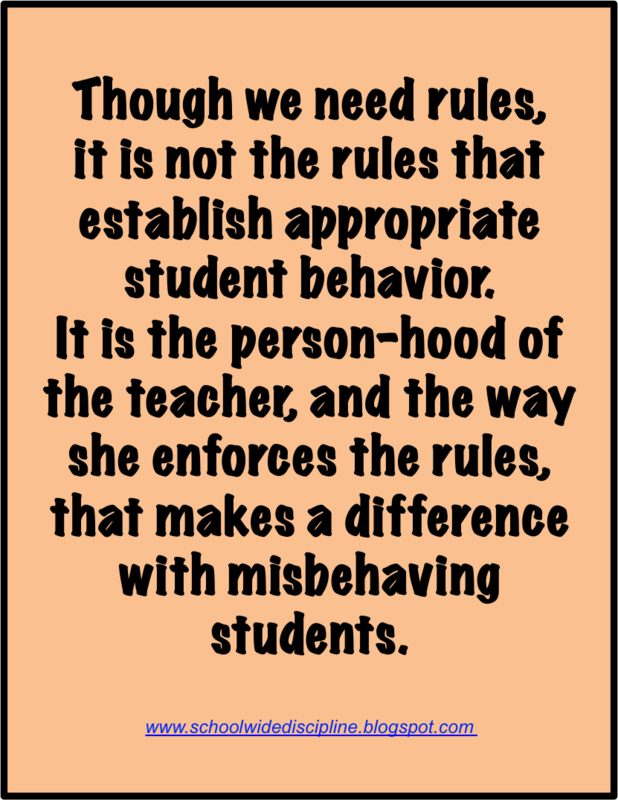 While effective teacher-managers do not need me to assign a set of rules to them in order to establish limits for behavior, many teachers do need this help. The personnel who work with students in alternative programs and sheltered placements can make better progress with our chronic students if they teach them to understand and respond to the same rules as those required in the regular classroom setting. The teachers and monitors of our intervention programs hold the same expectations for their smaller, sometimes more relaxed classes. After all, their goal is to prepare these struggling students to return to regular classes. Common rules communicate to teachers my standard for classroom behavior. Teachers who struggle with discipline, then, have the same expectations for their students as those who find student discipline easier to enforce. It is much easier to address a teacher's deficiencies with discipline when it is clear how every classroom needs to look. Common rules take the argument about rules away from the classroom level. Sometimes a student or parent wants to complain to a teacher that her rules are stupid or her expectations are unrealistic. The teacher can now tell the complainant, "These are the rules my principal insists we enforce. Would you like to talk to her?" I have never had a student or parent make an appointment to argue the rules with me yet. 1. Raise your hand and get permission before you speak. When students are allowed a significant amount of off-task talking, their minds are on their social interaction, not on their school work. They cannot apply their efforts to the level of critical thinking we work so hard to get them to do if they are busy joking, flirting, clowning, and gossiping. Some teachers seem to think it is unacceptable for students to talk while they, the teacher, is delivering a lesson, but when it is time for independent work, they allow students to chat. Is the teacher's delivery to the whole class more important than their students' focused concentration on the learning during independent work time? Sometimes teachers will argue that hand-raising gets in the way of a good discussion. They want the students to debate or discuss without the imposition of having to be called on. I clarify the use of the rule this way: "You are not leading a debate or discussion every minute of class. Sometimes students need to listen to you or to a peer during a lesson. Sometimes they need to read or write to interact with learning material. When you want them to engage in more authentic discussion, just tell them the new parameters. That is the same as giving permission, for the duration of your discussion activity." 2. Stay in your assigned seat unless you have permission to move. When I teach this rule, I show students how to enter the room and go directly, in as straight a route as possible, to their assigned seat. Therefore, I should never see Annette, whose assigned seat is two steps from the door, back in the far corner with Andrew before class. Because I expect my students to start class as soon as they enter the room, whether a bell has rung or not, they must sit down immediately and begin the work that is posted on the front board or projector screen. If I allowed middle school students to get out of their seats whenever they want to, or to pick where they are going to sit each day, there would be way too much distracting movement to accomplish much in any classroom. And that is the goal of each class time - to accomplish significant learning. Sometimes teachers will argue that they don't want to give permission to every student who needs to get a tissue, throw trash away, or sharpen a pencil. They would rather the student just take care of that as needed. I respond that all they have to do is give that permission to their students. They will need to point out that any student who uses that privilege to distract others or to disrupt learning will lose the privilege to get up for the permitted reasons. 3. Keep all belongings and body parts to yourself. This rule was originally written, "Keep your hands to yourself." 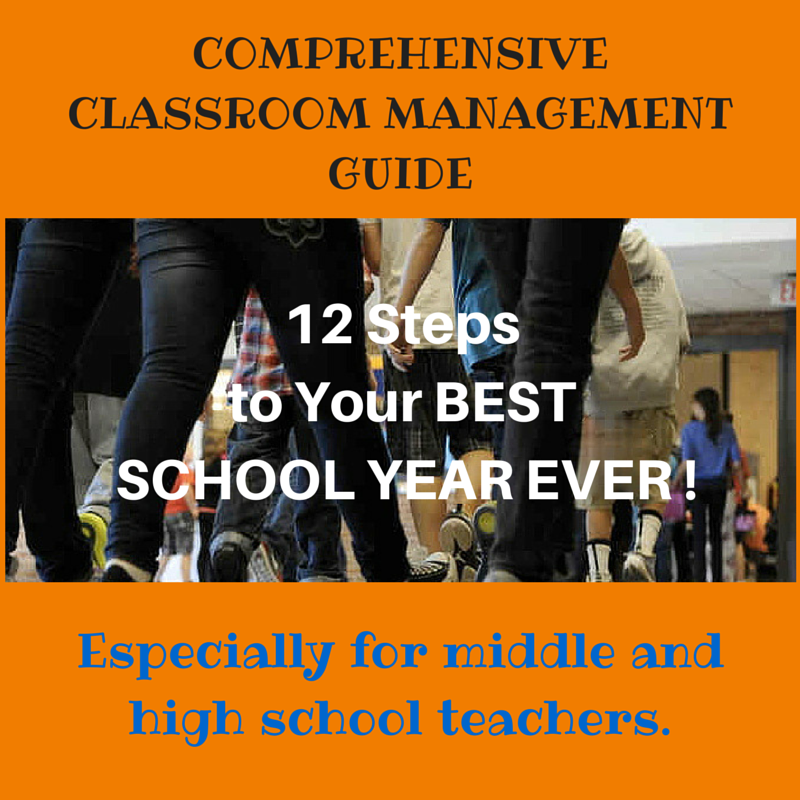 Then I had to add "feet" when I found myself correcting students for sticking their feet into an aisle to trip a peer or for stepping on their classmate's heels as they walked to lunch. Shortly thereafter, I had to add "all belongings" when I had to address students' swiping at one another with paper or pencil, book bag, ruler, protractor, book, hat, scarf, pompoms . . . you get the idea. This rule originally read, "No sleeping." When a teacher asks a student to wake up because his head is on his desk and his eyes are closed, the student will say, "I'm not sleeping. I'm just resting my eyes. I'm listening." That's not good enough. We need for our students to be alert, to participate, and to engage with us and with their peers in order for meaningful learning to occur. So we require an alert posture. 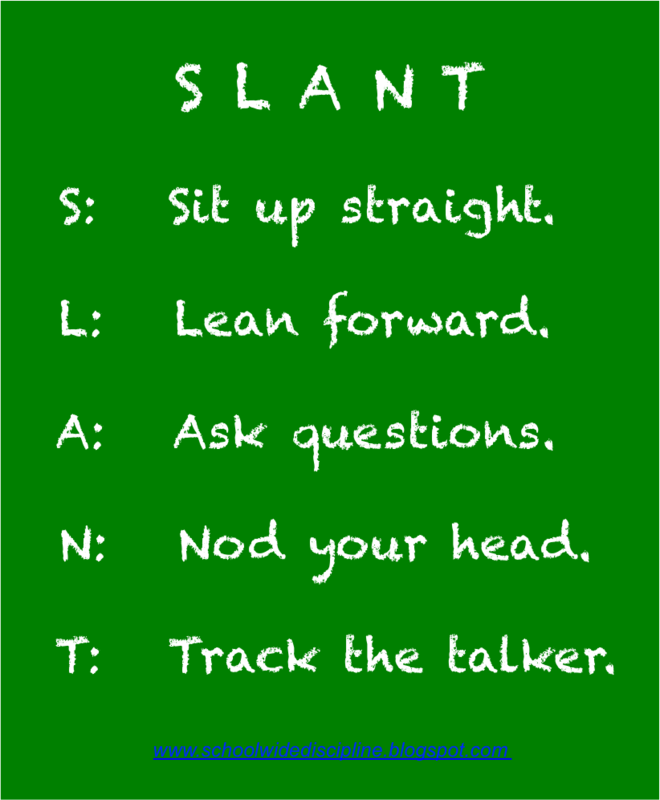 Our teachers also employ an acronym for keeping their students' attention called SLANT. It is not uncommon to hear my teachers say, "I need for you to SLANT, please" or "Track the speaker, please." Technique 32 in Teach Like a Champion describes the technique and how to use it: Learn SLANT and see it in action. If a student really is fatigued or sleepy, teachers will ask them to take a walk and get a drink of water to help them get some circulation going. They may allow them to stand in the back of the classroom or do a few tip-toe exercises to gain a little energy. They may decide that the student needs to see the nurse. But they will not allow a student to decide to use class time to nap or opt out of learning. 5. Follow all adult instructions immediately and completely. This is our catch-all rule, in case any of our little future lawyers want to haggle about certain behaviors that are not covered by one of our other rules. Adults have to be in charge in a school house. No student will be allowed to call the shots for long, if they try. All students have the right to feel safe and secure, as well as the right to pay attention to classroom activities and teachers' instructions so that they can learn. The only way to ensure all youngsters' security is for the grown-ups to stay large and in charge. When we need to, my assistant principal and I let students know that any adult in the building can tell them what to do, and we will expect them to obey. If a student feels he or she is being mistreated, they should tell one of us (the school administrators) or their parent, who can bring their issue to us. They are expected to remain respectful and to comply with every reasonable request. I have had the need to intervene with adults on behalf of students in my experience as a principal. Adults must treat students with respect and care at all times, even when a student acts ugly. I have no problem correcting adults' approaches to kids if they are hurtful. All teachers post a list of our common rules in their classrooms and go over them with their students during the first week of school. Communicating rules will only keep a certain percentage of the students behaving. It is not the rules that establish appropriate behavior. It is the person-hood of the teacher and the way she enforces the rules that makes a difference with misbehaving students.